When it comes to high-end luxury cars, one of the biggest factors in why people buy insanely expensive cars is the exclusivity. Incredibly, there's still places where having a Rolls-Royce Ghost won't get you noticed in a parking lot, which is why we see things like absurd chrome wraps and animal prints on house-priced cars. So far, however, no one's had the guts to take that radical next step, and make their multiple kidney-costing car look like a hunk of crap. This surprises me because the idea of showing status and wealth through obviously deliberately ruined items has long been a staple of the fashion world. Jeans carefully mangled, acid-burned, and ripped have been signifiers of obscene wealth for years, with designer-distressed jeans from places like Gucci (about $3 grand) or Dussault reaching insane prices of $250,000. There's entire schools of home and furniture design that revel in the beat-up, worn look for everything, sometimes called "shabby chic" or similar precious names. The point is, rich people having been showing how rich they are by paying metric assloads for beat-up crap for years, but so far they haven't tried doing that for their cars. But maybe it's time? A rough, unrefined look has been a staple of Rat Rod culture for decades, and their stuff always looks pretty damn cool. Plus, very serious vintage auto collectors will go bonkers over just the right amount of "patina" on a vintage car, with the goal being careful preservation of the wear instead of full restorations to better-than-new status. 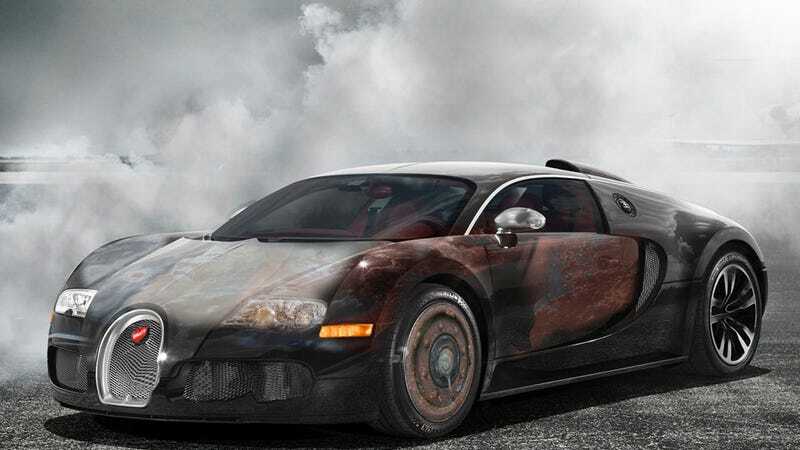 So, why aren't we seeing a special "Rust And Bondo" Edition Veyron? Or an Aston Martin Vantage with holes carefully pounded in the fenders, delicately treated with just the right amount of paint chipping, and then plugged with little metal skulls from some bin at Hot Topic? Sure, to most of us this idea seems repugnant and absurd. And, it is, though really no less repugnant or absurd than paying as much for a pair of all-but-crapped in jeans as you'd pay for a condo somewhere. Plus, consider the incredibile jobs that could come from this: you could start your own high-end vehicle distressing company! You'd specialize in applying absolutely individual and tailored distressing to any luxury car your client brings in — no two are the same! Want your Quattroporte to look like it's been abandoned in the desert for a few years? Done! That Panamera sure would pop with a bunch of indelible India-ink stains all over the hood an upholstery! How about pounding holes in the side of your Mercedes SLS AMG and then gluing in a bunch of reclaimed marbles I found buried in my yard! This is gonna be great. I'll (notice it's me now, since I've just decided I better start this business) wake up in the morning, take a client's Evora out on the highway and rub it against the guard rail for just the right amount of time, then I'll take a bunch of power sanders and drywall compound and make a half-assed map of Westeros on the hood. Sure, there's a hint of Art Car in there, but it's the damaging and distressing that really makes my work special. Who wants to sign up first?